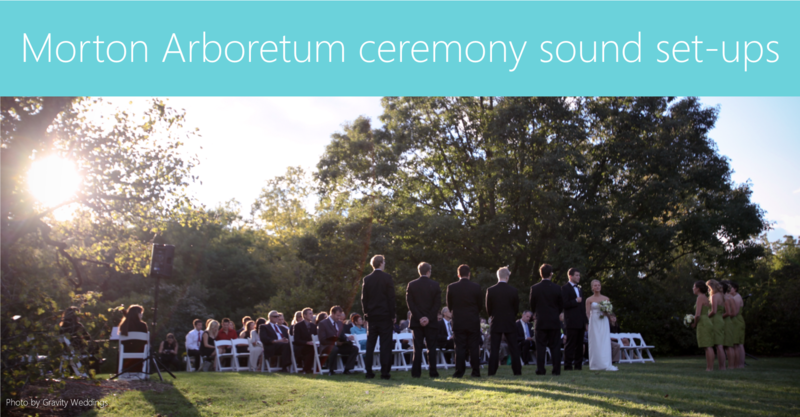 What's the best sound setup for my Morton Arboretum wedding ceremony? My teams play music at Morton Arbretum wedding ceremonies a LOT. In the height of the Chicago season, it seems like hardly a week goes by without at least one Backthird DJ, jazz group or string ensemble setting up there. And yet one thing we love about Arboretum weddings is that, if you get married there, your event won't unfold quite like anyone else's. The sheer number of spaces and the many ways to use them ensures that every couple's night takes a very personal shape. Couples saying vows at Morton Arboretum have a lot of gardens, lawns and rooms to choose from. It's no wonder, then, that one of the biggest questions Backthird office staff get is "What kind of sound setup does my wedding ceremony need?" What follows is our specific advice for various Morton Arboretum wedding ceremony spaces. 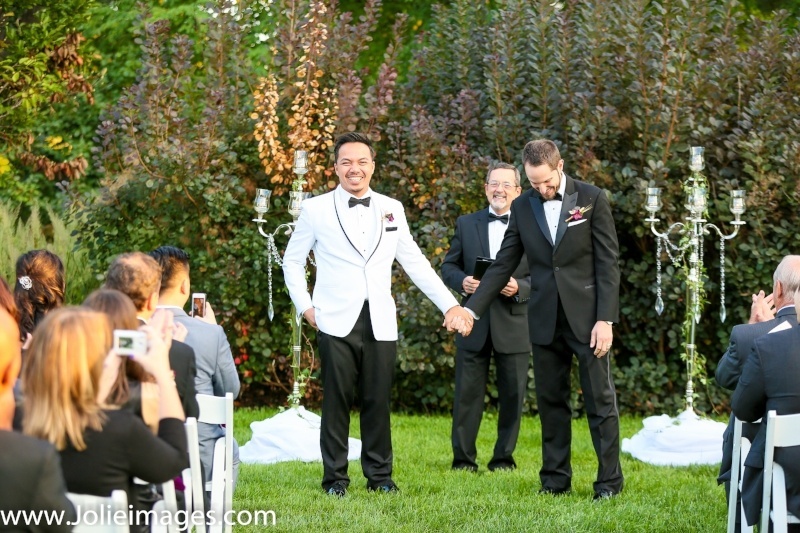 In every case, the goal is the same: To allow all of your guests to hear all of your ceremony without difficulty. For some areas, that means microphones are a must - in others, you could skip the sound setup and go entirely acoustic if your guest list is small.You can check out my general advice on ceremony sound in this post. Here's how it breaks down for Arboretum ceremonies. The Visitor Center is where The Ginkgo Room and Orientation Hall, Morton Arboretum's largest reception spaces, can be found. If your guest list is much larger than 150, you're probably planning to party in and around these spaces. The Hedge Garden is a wonderful space for a wedding ceremony - just a short walk from the Visitor Center, it's easy to access but the high hedges all around give a sense of quiet seclusion. You'll definitely want microphones for your officiant and other speakers for this large space - we often send Backthird sound engineers with two speakers, so they can spread them along the side of the space to help everyone hear clearly without cranking the volume too high. It's easy to tuck equipment behind a hedge, so no sound gear shows up in your photos. There's not a ton of shade in the Hedge Garden, so your guests will need to be willing to walk a short distance and catch a few rays. We've actually seen clever couples integrate fans or bug repellant into their decor with charming results. The Ginkgo Room and the Sycamore Room are nearby - if you've booked your reception in one of these rooms, your reception space will also double as a rain or cold-weather location for your Arboretum ceremony. We've seen some beautiful ceremonies in these spaces, which both offer great views of the Morton grounds. We recommend a sound system and microphones for both these larger rooms if you want guests to hear your vows well. Finally, the lawn outside the Sycamore Room is a lovely space for outdoor events as well. You'll definitely want a sound system here, even for a smaller ceremony, since the space is very open. Unamplified voices will disappear in the open air, leaving guests in the back rows unable to hear what's happening. If you're getting married early on an August afternoon, this lawn may not be the spot for you - there's no shade, and guests in formal clothes will get hot fast. Thornhill is the home of the Arbor Room and the Founders Room - charming event spaces where you're more likely to celbrate if your guest list is closer to the 100-person mark. There are also some wonderful outdoor locations nearby. The Thornhill Lawn, Morton Terrace and Thornhill patio are all popular spots for an outdoor wedding ceremony. Speakers and microphones are a must at any of these locations unless you're planning a very small ceremony (fewer than 50 guests). As an added note, be aware that while ceremonies on the lawn can be stunning, getting there means a good 100-yard walk down the hill in the grass. If mobility is a challenge for some of your guests, consider the more easily accessed patio or terrace first. How well do I have to understand my setup needs? I hope this article helps clear up some concerns - but you do NOT need to be a sound expert to get married. In fact, you've got better things to do! At Backthird, we assign every couple an Account Manager whose job it is to understand the details of your wedding day and put a plan together for you. You tell us what kind of music you're into, and let us worry about the technical requirements. We include them automatically in every quote we write. Most reputable entertainment companies should work this way - you tell them what you like, and they'll work out on their own the best way to make it happen. Just be aware that locations with more complicated sound needs tend to cost a little more. How much more? Download the guide below to see specifics on what different wedding setups cost at Backthird. For more Arboretum advice, read my Top 3 Do's and Don'ts for Morton Arboretum weddings, or take a look at our most popular Morton Arboretum wedding plans & prices.